British energy firm Burren Energy has been awarded two potentially lucrative oil exploration contracts in Egypt. The company successfully bid for the two contracts, granted by government owned oil firms, covering onshore and offshore areas in the Gulf of Suez. 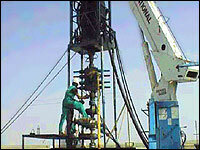 Burren Energy already has a presence in Egypt, having been awarded an exploration contract last year. The firm, which floated in 2003, recently announced a deal to buy 26% of Indian firm Hindustan Oil Exploration. The £13.8m deal gives Burren Energy access to the Indian oil and gas industry. This latest contract expands Burren Energy's global exploration and production portfolio - it also holds contracts in Turkmenistan and the Republic of Congo. "These assets significantly increase our exploration portfolio in Egypt and we continue to investigate further opportunities in this region," said chief executive Finian O'Sullivan.